The Halo franchise has returned once again, but will the latest installment in the wildly popular series be able to live up to the prestigious expectations? Search And Rescue: The first thing you will notice about ODST, if you haven't already known, is that you will no longer be in control of the legendary Master Chief. This time around, you will be controlling a member of the "ODST" (Orbital Drop Shock Trooper) dubbed "The Rookie". 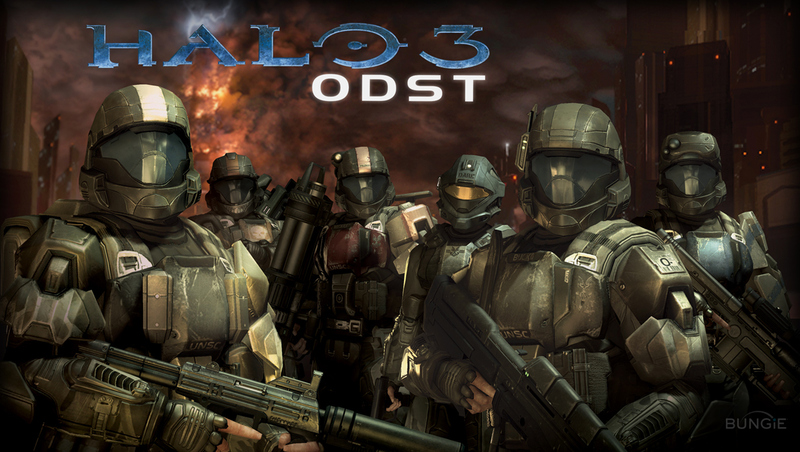 Halo 3: ODST takes place shortly before the last chapter in the Halo series and leads up to the events that open Halo 3. In ODST, the Covenant are trying to take over Earth and are rapidly gaining ground in the war against the humans. In order to fight back, the ODST are tasked with dropping out of a navy airship and onto a Covenant ship to wage war there. However, things do not go as planned and soon after launching out of the massive spaceship you and your team discover that you are off course and will unexpectedly land in the Earth city of New Mombasa. On your way down, The Rookie blacks out but eventually ends up landing in New Mombasa. When you awake, you realize that your team is missing and you are alone in this journey. The game soon turns into a search and rescue mission in the dead of night as you look for clues as to where your squad could have gone. As you find various objects relating to your team, you will be thrust into a flashback that follows what happened to your squad leading up to their disappearance. The storyline itself is nothing spectacular, but as usual the way it is told it done quite well. Bungie once again did a great job of turning a so-so plot into a well-told narrative that you would probably be interested in seeing through to the end. Little Spartan: In ODST, you will not be playing as Master Chief and thus will not possess the same abilities the super-soldier does. You will not run as fast, jump as high or be able to take as much damage as the legendary planet-saver; you do have similar abilities though. Even though you lack the ability to duel wield weapons, you pretty much are a mini version of the Spartan. You can take a far share of damage before dying, your melee attacks are devastating and the most significant difference between you and Master Chief is simply appearance. There has been one overhaul though, and that change has come in the health bar. You will no longer use simply your shield as your health, as you now have an actual health bar. Once your shield has been damage, you will begin to take damage to your health. You also cannot replenish your health without using a medical station or finding a medpack. While you won't notice much difference between Halo 3's Master Chief and ODST's The Rookie, it is nice to see a couple small differences from the two. It is easy to imagine that they could have made The Rookie much less powerful then he is though. A Sick Maze: In order to find the scattered remains of your company, you will have to search through the pitch black that is New Mombasa looking for the slightest hint of where to go. The environment can be very confusing and you will no doubt be lost more then once. The many, many areas of New Mombasa tend to look strikingly similar to each other and most everything from the walls, to the buildings all look too similar. That easily helps you lose your way in the darkness and while exploring can sometimes become maddening, as you seem to simply circle around the same areas over and over. While you can activate a rather helpful "nav" pointer that marks where you need to go next, when you begin to near your target your guiding waypoint ends and simply says "Your Beacon Is Nearby". Unfortunately, "nearby" is not near enough, as you will be forced to search through what seems like miles of city streets looking for a lone helmet stuck in a window or the one door out of a hundred that actually opens. Also, you rarely encounter any enemies to go up against while playing as The Rookie except for the occasional handful of resistance that is easily annihilated. It is an understatement to say that when you are not engaged in battle, there is a lot of downtime where you will be doing nothing but jogging through the seemingly infinite city. War is...Fun: Whenever you find a remnant of one of your missing comrades, you will be able to play back a few moments of their lives as I previously described. These flashback missions act as the action-filled portions of the game. While you search the empty city with The Rookie, you will be doing battle with the other characters of the squad. These more traditional Halo missions feel just like you would expect them to and while you will not find anything new in the gameplay during firefights, that isn't necessarily a bad thing. If its not broke, why fix it? You will move throughout moderately large levels using a variety of weapons and at times, vehicles, going up against massive numbers of Covenant soldiers ultimately reaching the end of the level and then going back to playing as The Rookie. Double Kill: The multiplayer has also remained unchanged for the most part. ODST comes with two discs in the box, one for the campaign and one for the multiplayer portion of the game. On the multiplayer disc, you will be able to play the same multiplayer that you knew and loved in Halo 3. Nothing is worse, but nothing is much better either. You will play as a Spartan on the human side, or an Elite on the Covenant side. You will also be treated to the same gameplay modes (with the exception of user-created modes), the Forge editing tool, and all of the Halo 3 maps as well as the 19 downloadable ones. Also included are 3 new maps, although one of them is a remake of a Halo 2 map! If you tired of the multiplayer action in Halo 3, you won't find anything new to draw you back in. The multiplayer is still unbelievably enjoyable for most, but there are no differences. There is one new addition to the multiplayer, although it is no on the multiplayer disc. Firefight mode is a cooperative multiplayer mode that is not unlike Gears of War 2's Horde mode. You and another friend on a local console (or up to three other killing machines over Xbox Live or system link) can team up and take on waves of increasingly difficult Covenant onslaughts. The Firefight mode is extremely hectic and acts as a great multiplayer mode that is different from what you usually see in Halo titles. As you and buddies battle against multiple assaults from enemy forces, it can become incredibly frantic and unbelievably fun. While you can play the Firefight mode alone, odds are you won't last past a couple of waves and even if you do there is not nearly as much fun to be had going it solo. Firefight is a great new mode that is best played with friends and is easily one of the most enjoyable modes in the entire game. Slowing Down There: On the visual side of things, the Halo engine used for the graphics may be starting to show its age. Although Bungie still did a decent job of keeping the graphics acceptable for the Xbox 360, they seem to be polished little since Halo 3. ODST does feature great voice acting once again though, and the voiceovers in this installment are outstanding. There is no doubt ODST has some of the best voice acting seen so far. Rent vs. Buy: Halo 3: ODST is a pretty solid game, especially when you are engaged in combat but the worst part of the game comes when you aren't. Running around the city streets looking for the smallest object or hint tends to grow rather boring, and the only reason we even played through those portions was to get to a flashback mission where the action heated up. Without those classic Halo missions and firefights, this game would be nothing but a boring game with an extremely boring environment. ODST still got a pretty high score, simply because the action-filled parts of the game were so heart pumping. However, even though this always feels like a Halo game, it doesn't always deliver the goods like one should. If you want or expect constant wars, then it may be best to lay off ODST unless you have a strategy guide to get you through the darkness quickly. If you don't have any guides though, there is a solid chance that you may get extremely bored looking for what you need to do next.